The mass of water vapor in a given volume. An atmospheric condition that exists when the environmental lapse rate is less than the moist adiabatic lapse rate. An atmospheric condition that exists when the environmental lapse rate is greater than the dry adiabatic lapse rate. The process in which incident radiant energy is retained by a substance by conversion to some other form of energy. The efficiency of radiation absorption. The growth of a precipitation particle by the collision of an ice crystal or snowflake with a supercooled liquid droplet that freezes upon impact. The rate of water lost from vegetation and soil, ordinarily at a slower rate than the potential rate. A line on a thermodynamic chart relating the pressure and temperature of a substance (such as air) that is undergoing a transformation in which no heat is exchanged with its environment. The rate of decreased temperature experienced by a parcel of air when it is lifted in the atmosphere under the restriction that it cannot exchange heat with its environment. For parcels that remain unsaturated during lifting, the dry adiabatic lapse rate is 9.8° per kilometer. A process that takes place without a transfer of heat between the system (e.g., an air parcel) and its surroundings. In an adiabatic process, compression always results in warming, and expansion results in cooling. The horizontal transport of an atmospheric property (e.g., temperature, moisture) solely by the wind; also, the rate of change of the value of the advected property at a given point due solely to wind transport. The large-scale advective tendency of temperature and moisture used to force SCMs and CSRMs, derived from constrained variational analysis. A system of colloidal particles dispersed in a gas (e.g., smoke or fog). The process in which radiation energy is retained by aerosols. Often incorrectly used synonymously with "aerosol Angstrom exponent", but should instead refer to the aerosol optical depth at the reference wavelength (1 um) in Angstrom’s power-law representation. The exponent of the inverse power-law that approximates the wavelength dependence of aerosol optical depth. Smaller particles have a stronger wavelength dependence and hence a larger Angstrom exponent. Number of aerosols per unit volume. The removal of radiant energy from an incident beam by the process of aerosol absorption and/or scattering. An increase in aerosol concentration. The optical properties of aerosols, including asymmetry factor, phase-function, single-scattering albedo, refractive index, and backscatter fraction. Linear size (e.g. radius or diameter) of an aerosol particle. The scattering of radiative energy by processes at the aerosol and molecular level. A device that resembles a wind vane with a propeller at one end. It is used to indicate wind speed and direction. The mass per unit volume of air; about 1.275 kilometer per cubic meter at 0° C and 1000 millibars. A body of air covering a relatively wide area and exhibiting horizontally uniform properties. The cumulative force exerted on any surface by the molecules composing air. Also known as "brightness," refers to the reflectivity - the percent of radiant energy returning from a surface compared to that which strikes it. A cloud belonging to a class characterized by globular masses or rolls in layers or patches, the individual elements being larger and darker than those of cirrocumulus and smaller than those of stratocumulus. These clouds are of medium altitude, about 8000-20,000 feet (2400-6100 meters). A middle cloud, usually white or gray, often occurs in layers or patches with wavy, rounded masses or rolls. A cloud belonging to a class characterized by a generally uniform gray sheet or layer, lighter in color than nimbostratus and darker than cirrostratus. These clouds are of medium altitude, about 8000-20,000 feet (2400-6100 meters). The air surrounding a cloud or the air surrounding rising or sinking air parcels. An instrument designed to measure wind speed. An instrument for measuring atmospheric pressure. A needle, attached to the top of an evacuated box, is deflected as changes in atmospheric pressure causes the top of the box to bend in or out; it contains no liquid. The departures of temperature, precipitation, or other weather elements from long-term averages. A large-scale circulation of winds around a central region of high atmospheric pressure, clockwise in the northern hemisphere, counterclockwise in the southern hemisphere. A very cold and dry air mass that forms primarily in winter and the northern interior of North America. A U.S. Department of Energy designated national user facility that provides a unique asset for the study of global change to the broader national and international research community. The acronym ACRF is no longer used, but has been shortened to just ARM or ARM Facility. The moisture content of the air as indicated by several measurements including relative humidity, specific humidity, dewpoint, vapor pressure, water vapor mixing ratio, and water vapor density; note that precipitable water is a separate type. The pressure exerted by the earth's atmosphere at any given point, determined by taking the product of the gravitational acceleration at the point and the mass of the unit area column of air above the point. A multi-program, interagency program funded by the U.S. Department of Energy (DOE) since 1989. The ARM Program is part of DOE's effort to study global climate change, specifically focusing on general circulation models. High frequency velocity fluctuations that lead to turbulent transport of momentum, heat, mositure, and passive scalars, and often expressed in terms of variances and covariances. A region of the electromagnetic spectrum, from 8 to 12 micrometers, where the atmosphere is transparent to radiation. 1. The direction or bearing toward which a sloping surface faces (e.g., a north-facing slope has an azimuth angle of 360°; a northeast-facing slope, an azimuth angle of 45°). 2. The arc of the horizon measured clockwise from north to the point where a vertical circle through a given heavenly body intersects the horizon (e.g., used for solar azimuth angle). The ratio of cross polarized to co-polarized elastic backscatter. The scattering of radiant energy into the hemisphere of space bounded by a plane normal to the direction of the incident radiation and lying on the same side as the incident ray. An instrument that measures atmospheric pressure. The two most common barometers are the mercury barometer and the aneroid barometer. The pressure of the atmosphere, as indicated by a barometer. A web-based tool that is used to discuss, review, and approve an "engineered product" or other changes to infrastructure components as it is turned over to ARM Operations. A scale of wind strength based on visual assessment of the effects of wind on seas and vegetation. A hypothetical object that absorbs all of the radiation that strikes it; also emits radiation at a maximum rate for its given temperature. The concentration of carbon in its very absorbing, elemental, non-organic, non-oxide form (e.g. graphite). A severe weather condition characterized by low temperatures and strong winds (greater than 32 miles per hour) bearing a great amount of snow. When these conditions continue after the falling snow has ended, it is termed a ground blizzard. The atmosphere between the Earth's surface and an altitude of about 1 to 2 kilometers affected by heat and moisture. The ratio of energy available for sensible heating to energy available for latent heating. When the temperature is held constant, the pressure and density of an ideal gas are directly proportional. An elevated inversion layer that caps a convective boundary layer, keeping the convective elements from rising higher into the atmosphere. The amount of carbon dioxide, a heavy, colorless greenhouse gas, per unit of volume. The rate of flow for carbon dioxide, a heavy, colorless greenhouse gas. A force directed outward, away from the center of a rotating object; equal in magnitude to the centripetal force but in the opposite direction. An inward-directed force that confines an object to a circular path and is equal in magnitude to the centrifugal force but in the opposite direction. With constant pressure, the temperature of an ideal gas is inversely proportional to the density of the gas. A warm, dry wind on the eastern side of the Rocky Mountains. In the Alps, the wind is called a Foehn. A cirriform cloud characterized by thin, white patches, each of which is composed of very small granules or ripples. These clouds are of high altitude (20,000-40,000 feet or 6000-12,000 meters). A cloud belonging to a class characterized by a composition of ice crystals and often by the production of halo phenomena. It appears as a whitish and usually somewhat fibrous veil, often covering the whole sky and sometimes so thin as to be hardly discernible. These clouds are of high altitude (20,000-40,000 feet or 6000-12,000 meters). Wispy-looking cloud belonging to a class characterized by thin white filaments or narrow bands and a composition of ice crystals. These clouds are of high altitude (20,000-40,000 feet or 6000-12,000 meters). The accumulation of daily and seasonal weather events over a long period of time. It is a description of aggregate weather conditions; the sum of all statistical weather information that helps describe a place or region. The lowest portion of a cloud. For a given cloud or cloud layer, the lowest level of the atmosphere where cloud properties are detectable. A particle, either liquid or solid, upon which water condenses to form cloud droplets. The amount of the sky obscured by clouds when observed at a particular location. The top of a cloud layer, usually viewed from an aircraft. Fraction of sky covered by clouds, observed directly or derived from SW irradiance. The concentration (mass/vol) of ice water particles in a cloud. The concentration (mass/vol) of liquid water droplets in a cloud. For a given cloud or cloud layer, the highest level of the atmosphere where cloud properties are detectable. The merging of cloud droplets into a single larger droplet. A program joining with the ARM Program to pursue a specific set of objectives by providing resources and participating in active planning and execution of the effort, such as a field campaign. The process by which water changes phase from a vapor to a liquid. The transfer of heat by molecular activity from one substance to another, or through a substance. Transfer is always from warmer to colder regions. A cloudlike streamer frequently seen forming behind aircraft flying in clear, cold, humid air. Vertical motion within the atmosphere due to thermal instability, with important impacts on the type cloud systems that can develop. The level above the surface marking the base of a cumuliform cloud that is forming due to surface heating and rising thermals. An atmospheric condition that exists when the winds cause a horizontal net inflow of air into a specified region. A program or agency supporting a specific ARM effort, such as a field campaign, wherein ARM provides the resources. Used to identify and document problems with ARM systems, physical infrastructure, or instruments. The size and shape of the crystals in a crystalline solid. Also known as habit. A cloud belonging to a class indicative of thunderstorm conditions characterized by large, dense towers that often reach altitudes of 30,000 feet (9000 meters) or more, cumuliform except for their tops, which appear fibrous because of the presence of ice crystals. The cloud is frequently accompanied by heavy showers, lightning, thunder, and sometimes hail. It is also known as a thunderstorm cloud. Puffy white cloud belonging to a class characterized by dense individual elements in the form of puffs, mounds or towers, with flat bases and tops that often resemble cauliflower. They are found at a lower altitude than altocumulus, usually below 8000 feet (2400 meters). An instrument used to monitor wind speed. Wind rotation of cups generates and electric current calibrated in wind speed. A large-scale circulation of winds around a central region of low atmospheric pressure, counterclockwise in the northern hemisphere, clockwise in the southern hemisphere. Serves as long-term storage for ARM data to keep data easily accessible. It is located at Oak Ridge National Laboratory. Manages ARM datastream and provides for the collection, processing, analysis, and delivery of ARM data. Controls the data flow and minimizes data loss. Its primary functions are data collection, storage, and processing. The basic information, definitions, and metadata required to process "raw" measurement data to standard NetCDF files. An assessment report issued by the Data Quality Office and/or instrument mentors based on a data quality inspection. These reports are databased and used as the basis for other formal ARM reports such as the Data Quality Problem Report, Problem Identification Form, or Data Quality Report. The Data Quality Office website that displays automatically generated data quality results. Formed in July 2000 to coordinate ARM's Data Quality Program. An ARM infrastructure problem report issued to site operators by the Data Quality Office, instrument mentors, and/or site scientists to report a problem discovered through data quality inspection; problems reported through this mechanism are those that can be solved by site operators with guidance from instrument mentors or site scientists. Run by the ARM Program Data Quality Office to help coordinate the continued evolution and implementation of efforts to assure the quality of the data collected by its field instrumentation. Similar files that are in a time-sequenced series. The ratio of the mass of a substance to the volume occupied by it. A process that occurs in subfreezing air when water vapor changes directly to ice without becoming a liquid first. A new datastream generated by applying an algorithm or model to existing data. The temperature to which air must be cooled (at constant pressure and constant water vapor content) for saturation to occur. When the dew point falls below freezing it is called the frost point. The solar radiation that is scattered or reflected by atmospheric components (e.g., clouds) to the earth's surface. All of the solar radiation, across the wavelength range of 0.4 and 4 µm, coming directly from the sky except for solar radiation coming directly from the sun and the circumsolar irradiance within approximately three degrees of the sun. The narrow spectral range of measurements coming directly from the sky except for solar radiation coming directly from the sun whose wavelength falls within the solar range of 0.4 and 4 µm. The solar radiation that is transmitted directly through the atmosphere to the earth's surface without interacting with atmospheric components. Radiant energy, across the wavelength range of 0.4 and 4 µm, that is transferred directly from the sun to the receiver. The narrow spectral range of measurements coming directly from the sun whose wavelength falls within the solar range of 0.4 and 4 µm. Means daily, especially pertaining to actions which are completed in 24 hours and are repeated every 24 hours. An atmospheric condition that exists when the winds cause a horizontal net outflow of air from a specific region. When used, the positive is down (towards the radar). Particle and air motions contribute to the velocity. Downward-moving air, usually within a thunderstorm cell. The total diffuse and direct radiant energy, at wavelengths longer than approximately 4 µm, that is being emitted downwards. The total diffuse and direct radiant energy that comes from some continuous range of directions, at wavelengths between 0.4 and 4 µm, that is being emitted downwards. Small drops between 0.2 and 0.5 millimeters in diameter that fall slowly and reduce visibility more than light rain. The rate at which the temperature of a parcel of dry air decreases as the parcel is lifted in the atmosphere. The dry adiabatic lapse rate is 5.5°F per 1000 feet or 9.8°C per kilometer. Roughly a north-south boundary between moist air in the Mississippi Valley and dry air on the west side of the Great Plains descending from the Mexican Plateau and Southern Rockies. Thunderstorms often form along this line, which moves eastward during the morning and westward in the evening. Swirling air currents that varies from the main air current. A correction factor, dependent on the radiational characteristics of the earth-atmosphere system, that permits application of black body radiation laws to the earth-atmosphere system. Means literally, the Christ child, a name given to an extensive ocean warming in the equatorial eastern Pacific along the coast of Peru and Ecuador that often begins around Christmas (hence, the name). The warming brings nutrient-poor tropical water southward along the west coast of South America in major events that recur at intervals of 3 to 7 years. El Niño is associated with atmospheric circulations that produce wide ranging effects on global weather and climate. The rate at which a black body radiates energy across all wavelengths. An engineering task or project directly resulting from an Engineering Change Request. It is tracked and addresses project requirements, analysis, design, development, testing, and documentation. A method of formally requesting that a change be made to the infrastructure. This change can be to a particular instrument, data system, data process, datastream, measurement method, or facility. Used to request engineering resources, as soon as possible, when operational, science, or engineering needs require a quick engineering response where no design or redesign is required. The necessary vapor pressure around liquid water that allows the water to remain in equilibrium with its environment. It is also called saturation vapor pressure. The vaporization of water through direct evaporation from wet surfaces and the release of water vapor by vegetation. Data whose origin is not from within the ARM Program; may include data observed at ARM facilities, but whose processing and quality control is done by another program or agency and captured by ARM through the ARM External Data Center. Stores data from non-ARM sources. It is managed by Brookhaven National Laboratory. Instruments that belong to organizations that are outside of the ARM Program. The time of extreme meteorological events such as min/max temperature and wind gusts. The falling ice crystals that evaporate before reaching the ground. A scheduled period of time, or a field campaign, when the frequency of observations is changed to augment routine data acquisition at a site or to satisfy a particular data requirement. The rate of transfer of fluids, particles or energy per unit area across a given surface. A cloud with its base at the earth's surface. It reduces visibility to below 1 kilometer. A measure of the surface stress reflecting the effects of surface roughness and wind velocity. An interface or zone of transition between two distinct air masses. A temperature inversion that develops aloft when warm air overruns the cold air behind a front. A numerical representation of the climate system based on the physical, chemical, and biological properties of its components, their interactions, and feedback processes. General circulation models can provide a comprehensive representation of the climate system and are key elements of modern climate research and the effort to accurately predict future climate. An approach to collecting useful information to help the Science Team fulfill the project mission. Six identified focus areas for ARM's data collection and research activities. These focus areas are shortwave radiation, longwave radiation, clouds, aerosols, atmospheric state, and surface energy exchange. These areas will change over time as research goals are narrowed and new observational programs are developed. Gravity-weighted height of a pressure surface, usually in a model that uses pressure as the vertical coordinate. A theoretical horizontal wind blowing in a straight path, parallel to the isobars or contours, at a constant speed. The geostrophic wind results when the Coriolis force exactly balances the horizontal pressure gradient force. A navigation system which uses a constellation of artificial earth satellites to make precise determinations of the latitude and longitude of locations on the earth's surface or in the atmosphere. A rate of change with respect to distance of a variable quantity, as temperature or pressure, in the direction of maximum change. The same as snow pellets or small hail. Atmospheric heating caused by solar radiation being readily transmitted inward through the earth's atmosphere but longwave radiation less readily transmitted outward, due to absorption by certain gases in the atmosphere. Same as Coordinated Universal Time (UTC); the international time standard kept at Greenwich, England. Solid precipitation in the form of chunks or balls of ice with diameters greater than 5 millimeters. The stones fall from cumulonimbus clouds. Transparent or partially opaque particles of ice that range in size from that of a pea to that of golf balls. Rings or arcs that encircle the sun or moon when seen through an ice crystal cloud or a sky filled with falling ice crystals. Halos are produced by reflection of light by ice crystals suspended in the earth's atmosphere and exhibiting prismatic coloration ranging from red inside to blue outside. The fine dry or wet dust or salt particles dispersed through a portion of the atmosphere. Individually these are not visible but cumulatively they will diminish visibility. A form of energy transferred between systems by virtue of their temperature differences. The ratio of the heat absorbed (or released) by a system to the corresponding temperature rise (or fall). An index that combines air temperature and relative humidity to determine an apparent temperature-how hot it actually feels. An international unit of frequency equal to one cycle per second, and named after a German physicist. The horizontal wind in terms of either speed and direction, or the zonal (u) and meridional (v) components. A severe tropical cyclone having winds in excess of 64 knots (74 miles per hour). Information that delineates hydrometeors into such microphysical classes as rain, snow, graupel, and hail. An instrument designed to measure the air's water vapor content. The sensing part of the instrument can be hair (hair hygrometer), a plate coated with carbon (electrical hygrometer), or an infrared sensor (infrared hygrometer). The rate that aerosol particles grow at relative humidity values less than 100 percent. Precipitation consisting of small, slowly falling crystals of ice. Particles that act as nuclei for the formation of ice crystals in the atmosphere. The downwelling atmospheric emission in the 9.9 to 11.4 micrometers band; in general, relatively warmer temperatures imply "thicker" clouds. The electromagnetic radiation with wavelengths between about 0.7 and 1000 micrometers. This radiation is longer than visible radiation but shorter than microwave radiation. ACRF management team that manages the overall budget, planning, user request screening, activity implementation, and impact assessments for the ARM Climate Research Facility. The chemical composition of an aerosol, with the exception of those with hydrocarbons, and usually including carbides, oxides of carbon, metallic carbonates, carbon sulfur compounds, and carbon nitrogen compounds. An approach that involves collecting data on the distribution of radiation and the radiatively active constituents of the atmosphere and radiative properties of the lower boundary. The basic concept is that the model and atmospheric observations must be analyzed together. Data processing module that transforms data from the instrument output format into a designed data structure in netCDF format. The technical point of contact for ACRF instrument systems. Mentors are the presumed experts on the instrument and the data it provides. The rate at which radiant energy in a radiation field is transferred across an area of a surface (real or imaginary) in a hemisphere of directions. A line of equal or constant pressure; an isopleth of pressure. A line on a weather map or chart connecting points where winds of equal speeds have been recorded. A line of equal or constant temperature, an isopleth of temperature. The temperature remaining constant with height or time. A line of constant equal physical properties along all axes. A fast-moving wind current surrounded by slower moving air. Generally strong westerly winds concentrated in a narrow and shallow stream in the upper troposphere. A loose term for filamentous cirrus that appears to radiate from a point in the sky, and exhibits characteristics associated with strong vertical wind shear, such as twisted or curved filaments. Vertical waves in the air associated with wind shear across statically stable regions. Can appear as breaking waves and as braided patterns in radar images and cloud photos. The rate at which an atmospheric variable (usually temperature) decreases with elevation. The heat that is either released or absorbed by a unit mass of a substance when it undergoes a change of state (e.g., during evaporation, condensation, or sublimation). The time rate of flow for the specific enthalpy difference between two phases of a substance at the same temperature, typically water. An instrument similar to a radar but uses a laser to generate light pulses rather than radio waves, generally used to measure aerosol content and particle movement. Usually refers to contributions of radiation from the atmosphere along the line-of-sight (path) that an instrument receives. A measure of the weight of the liquid water droplets in the atmosphere above a unit surface area on the earth, given in units of kg m-2. The difference between upwelling and downwelling broadband longwave radiation. The rate at which light energy in the longwave portion of the spectrum is emitted in a particular direction per unit of projected surface area perpendicular to the direction of radiation. A term used to describe the infrared energy emitted by the earth and atmosphere at wavelengths between about 5 and 25 micrometers. Compare this to shortwave radiation. A regular, strong, nighttime, northward flow of maritime tropical air over the sloping Great Plains of the central United States. The wind increases to a peak in the lowest kilometer and then decreases above. Pertains to meteorological phenomena, such as wind circulations or cloud patterns, that are greater than 200 kilometers in horizontal extent. The layer below the 0°C isotherm where snowflakes melt and turn into raindrops. When viewed by radar this layer appears as a band of enhanced reflectivity; thus it is commonly known as the "radar bright band." The microphysics of the melting layer of precipitation is an important feature for stratiform precipitation. The melting layer's degrading effect on satellite communication links makes understanding it important as well. A scale of meteorological phenomena that ranges in size from a few km to about 100 kilometers. It includes local winds, thunderstorms, and tornadoes. Often described as "information or data about the data." Typically refers to information about primary data, which is usually numerical, or information describing aspects of the primary data. Such information could include, for example, instrument site information, environmental conditions under which the data were acquired, and any other data needed to understand the primary data. The components of the ARM data system that collect and report data stream metadata. Formerly known as the Site Ops Log. The study of the atmosphere and atmospheric phenomena as well as the atmosphere's interaction with the earth's surface, oceans, and life in general. A distinction can be drawn between meteorology and climatology, the latter being primarily concerned with average, not actual, weather conditions. An intense, localized downdraft of air that spreads on the ground, causing rapid changes in wind direction and speed; a localized downburst. Pertains to meteorological phenomena, such as wind circulations or cloud patterns, that are less than 2 kilometers in horizontal extent. Electromagnetic radiation generally in the frequency range between 300 MHz and 300 GHz (wavelengths between 1mm and 1m). A unit of atmospheric pressure equal to 1/1000 bar, or 1000 dynes per square centimeter. Sea level pressure is normally close to 1013 millibars. The ratio of the mass of water vapor in a given volume of air to the mass of dry air. The ARM Mobile Facility (AMF) was first deployed in 2005; it consists of large shipping containers converted into laboratories. The laboratories are equipped with computer systems connected to the high-tech instruments that collect data from the atmosphere. A simplified representation of a physical process. When referred to in textual references, the ARM conception of "near-real time" is "with a few hours delay." A quantity measured near the surface of the soil, according to the formula B = ? (dT/dz), where ? is the conductivity of the soil that the heat or moisture is moving through. A quantity measured near the surface of the soil, according to the formula B = ? (dq/dz), where ? is the conductivity of the soil that the heat or moisture is moving through. The difference between upwelling and downwelling, covering longwave and shortwave radiation. An atmospheric condition that exists in unsaturated (saturated) air when the environmental lapse rate equals the dry (moist) adiabatic rate. A cloud of the class characterized by a formless layer that is almost uniformly dark gray; a rain cloud of the layer type, of low altitude, usually below 8000 feet (2400 meters). A colorless, tasteless element that comprises four-fifths of the atmosphere by volume, denoted by N2. The third ARM research site, the NSA locale has is located in Barrow, Alaska. Its polar regions are predicted to undergo the largest warming in response to the increasing carbon dioxide in the atmosphere. A composite of two fronts, formed as a cold front overtakes a warm or quasi-stationary front. Two types of occlusions can form depending on the relative coldness of the air behind the cold front to the air ahead of the warm or stationary front. A cold occlusion results when the coldest air is behind the cold front and a warm occlusion results when the coldest air is ahead of the warm front. A measure of how much light airborne particles, whether aersols, cloud droplets, or ice particles, prevent from passing through a column of atmosphere. Ozone measurements are given in Dobson units and are integers with 3 significant figures. A Dobson Unit represents the physical thickness of the ozone layer if it were brought to the earth's surface. A value of 300 Dobson units equals three millimeters. The number of particles present in any given volume of air. The number of particles present in any given volume of air within a specified size range. A small helium-filled meteorological balloon that is tracked as it rises through the atmosphere to determine how wind speed and direction change with altitude. Top of the planetary boundary layer; also known as depth or height of the mixing layer. The energy that a body possesses by virtue of its position with respect to other bodies in the field of gravity. The temperature that a parcel of dry air would have if it were brought dry adiabatic ally from its original position to a pressure of 1000 millibars. Total amount of water vapor in a vertical column of air, often expressed as the depth of the layer of water that would be formed if all the water vapor were condensed to liquid water. All liquid or solid phase aqueous particles that originate in the atmosphere and fall to the earth's surface. Data that have not necessarily been subjected to review, quality control and/or documentation by a responsible investigator. Preliminary data are not considered publishable without the coordination and concurrence of the responsible investigator. Generally applicable only to field campaigns when data sources beyond routine ARM data are being acquired. The wind direction most frequently observed during a given period. An instrument used to measure the water vapor content of the air. It consists of two thermometers (dry bulb and wet bulb). After whirling the instrument, the dew point and relative humidity can be obtained with the aid of tables. An instrument that measures the combined intensity of incoming direct solar radiation and diffuse sky radiation (diffuse irradiance). A special class of value-added product that regularly compares two or more data sets intended to understand the individual datastreams either as functions of the performance of an instrument or the accuracy of a model prediction. Typically, the final form of data to be submitted to the ARM data system. Includes datastream description documentation, fully calibrated data in commonly used geophysical units, quality flagged data files, and all ancillary data (metadata) needed by a future user of the datastream to make full sense of it. Daily and weekly plots of ARM data that give users a browsable quick view of a subset of data available at the ARM Archive. An instrument useful for remote sensing of meteorological phenomena. It operates by sending radio waves and monitoring those returned by such reflecting objects as raindrops within clouds. The power spectrum and moments of the radar signal expressed as a function of Doppler frequency or Doppler velocity. It may be thought of as the reflectivity weighted ratio velocity distribution of the scatterers in a distributed target. 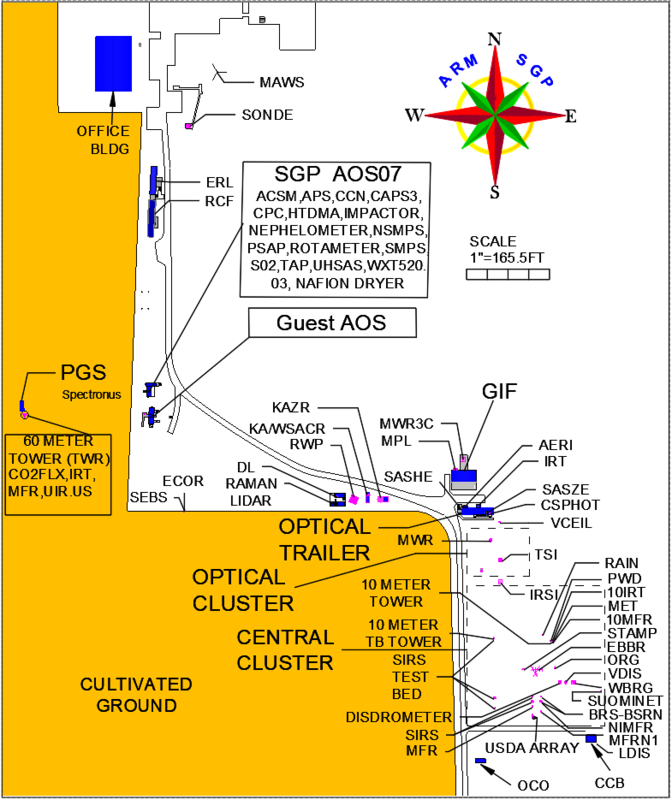 A measure of the efficiency of a radar target intercepting and returning radio energy. It depends upon the size, shape, aspect, and dialectic properties of that target. A measure of the intrinsic radiant energy flux intensity emitted by a radiator in a given direction, expressed in units of energy per unit time per unit solid angle. Energy transported through electromagnetic waves. These waves do not need molecules to propagate them, and in a vacuum they travel at nearly 300,000 kilometers per second. See shortwave radiation and longwave radiation. The heating rate due to the divergence of long and shortwave radiative flux; this is a calculated quantity using the state of the atmospheric and including effects of clouds and aerosols. An instrument carried through the air by a balloon. It uses a small, dispensable radio transmitter to read information on atmospheric temperature, pressure, and humidity. Precipitation that falls to earth in drops more than 0.5 millimeters in diameter. A device, usually a cylindrical container, for measuring rainfall. The process whereby a surface turns back a portion of the radiation that strikes it. A measure of the returned power, which is sensitive to the size and number of hydrometeors (i.e., the particle size spectra). The bending of light as it passes from one medium to another. Rhe ratio of the amount of water vapor actually in the air compared to the amount of water vapor the air can hold at the particular temperature and pressure. The ratio of the air's actual vapor pressure to its saturation vapor pressure. A narrow elongated area of relatively high pressure on a weather chart. The maximum amount of water vapor necessary to keep moist air in equilibrium with a surface of pure water or ice. It represents the maximum amount of water vapor that the air can hold at any given temperature and pressure. An ACRF group made up of the ARM Science Team Executive Committee working group science chairs and climate research community appointees, that ensures that the user facility is conducting the best quality science by reviewing proposals and making recommendations to U.S. Department of Energy. The committee that provides recommendations, prioritization, coordination of activities, and program vision to the U.S. Department of Energy Program Manager and ARM Chief Scientist on overall ARM Program science. The atmospheric pressure at mean sea level. The time rate of flow for the energy transferred from a warm or hot surface to whatever is touching it, typically air. A thunderstorm that produces heavy precipitation, frequent lightning, strong, gusty surface winds or hail. A severe thunderstorm can cause flash flooding and wind and hail damage and may spawn tornadoes. The rate at which radiant energy, at wavelengths between 0.4 and 4 µm, is being transferred across an area of a surface (real or imaginary) in a hemisphere of directions. The difference between upwelling and downwelling broadband shortwave radiation. A measure of the intrinsic radiant energy flux intensity, at wavelengths between 0.4 and 4 µm, emitted by a radiator in a given direction, expressed in units of energy per unit time per unit solid angle. The rate at which radiant energy, at specrally-resolved wavelengths between 0.4 and 4 µm, is being emitted upwards and downwards into a radiation field and transferred across a surface area (real or imaginary) in a hemisphere of directions. A relatively small-scale trough that is superimposed on and propagates through the longer wavelength Rossby waves. An approach to the development and testing of cloud formation and parameterizations. The idea of the SCM is to measure the external forces on a column of the atmosphere that corresponds to a single general circulation model grid column, to use models to compute the cloud formation and radiative transfer processes, and to evaluate the results produced by the models through comparisons with additional observations. A descriptive measure of radiation in terms of the temperature of a hypothetical black body emitting an identical amount of radiation at the same wavelength. An instrument used to measure the water vapor content of the atmosphere, which wet and dry bulb thermometers are mounted on a frame connected to a handle at one end by means of a bearing or a length of chain. The psychrometer is whirled by hand to provide the necessary ventilation to evaporate water from the wet bulb. The moisture of the soil measured near the surface. This includes soil wetness and soil water potential. The temperature measured near the surface of the soil. The first of the ARM research sites, the SGP site is located in south Kansas and north Oklahoma. It is host to virtually every type of cloud system throughout the year. A measure of the spread of the Doppler spectrum and consequently is sensitive to the spread in the particle size spectra. A larger spectral width is indicative of the presence of a broader range of sizes of hydrometeors. A hypothetical vertical distribution of temperature, pressure and density which, by international consent, is taken to be representative of the atmosphere for purposes of pressure altimeter calibrations, aircraft performance calculations, aircraft and missile design, ballistic tables, etc. The actual air pressure measured at the observing station. A cloud having predominantly horizontal development. A cloud belonging to a class characterized by large dark, rounded masses, usually in groups, lines, or waves, the individual elements being larger than those in altocumulus and the whole being at a lower altitude, usually below 8000 feet (2400 meters). The layer of the atmosphere above the troposphere and below the mesosphere (between 10 km and 50 km), generally characterized by an increase in temperature with height. A cloud belonging to a class characterized by a gray, horizontal layer with a uniform base, found at a lower altitude than altostratus, usually below 8000 feet (2400 meters). The process whereby ice changes directly into water vapor without melting. In meteorology, sublimation can also mean the transformation of water vapor into ice. The slow sinking of air, usually associated with high-pressure areas. The fraction of incoming solar radiation at a surface (i.e., land, cloud top) that is effectively reflected by that surface. State of the surface, including vegetation, land use, surface type, roughness, and such; often provided in model output. The vertical flux of surface moisture due to atmospheric turbulent transport. The radiative surface skin temperature, from an infrared thermometer measuring the narrowband radiating temperature of the ground surface in its field of view. The vertical flux of momentum near the surface as the the ambient flow interacts with the land/water surface. The typical weather map scale that shows features such as high- and low-pressure areas and fronts over a distance spanning a continent. Also called the cyclonic scale. Typically ranging on the scale of 1000 to 2500 kilometers. The degree of hotness or coldness of a substance as measured by a thermometer. It is also a measure of the average speed or kinetic energy of the atoms and molecules in a substance. An extremely stable air layer in which temperature increases with altitude, the inverse of the usual temperature profile in the troposphere. A small, rising parcel of warm air produced when the earth's surface is heated unevenly. An intense, rotating column of air that protrudes from a cumulonimbus cloud in the shape of a funnel or a rope and touches the ground. The total concentration of carbon in all its organic and non-organic forms. The total concentration (mass/vol) of ice and liquid water particles in a cloud. The passage of water vapor into the atmosphere through the vascular system of plants. The second ARM research site, it is located in the south Pacific Ocean occupying Manus Island, Nauru Island, and Darwin, Australia. The site features the warmest ocean water, highest atmospheric water vapor contents, and the most convective cloud regimes in the world. It also plays a key role in the El Niño phenomenon. The boundary between the troposphere and stratosphere, characterized by an abrupt change in temperature lapse rate (temperatures decrease with height in the troposphere, but it increases or remains constant with height in the stratosphere). The portion of the earth's atmosphere from the surface to the tropopause; that is, the lowest 10-20 kilometers of the atmosphere. The troposphere is characterized by decreasing temperature with height, and is the layer of the atmosphere containing the most clouds and other common weather phenomena. On a weather chart, a narrow, elongated area of relatively low pressure. An irregular motion of the atmosphere, as indicated by gusts and lulls in the wind. An electromagnetic radiation with wave-lengths longer than X-rays but shorter than visible light. A U.S. Department of Energy program that uses an unmanned aerospace vehicle and occupied aircraft to make key climate measurements that cannot be made my other means. Weather maps that are produced for the portion of the atmosphere above the lower troposphere, generally at and above 850 millibars. Isolines on these maps usually represent the heights of a constant pressure surface, such as the 500 millibars surface. The rate at which radiant energy, at a wavelength longer than approximately 4 µm, is being emitted upwards into a radiation field and transferred across a surface area (real or imaginary) in a hemisphere of directions. The rate at which radiant energy, at a wavelength between 0.4 and 4 µm, is being emitted upwards into a radiation field and transferred across a surface area (real or imaginary) in a hemisphere of directions. Means Coordinated Universal Time (UTC); the international time standard kept at Greenwich, England. Physical models using ARM instrument data as inputs used to fulfill some of the unmet measurement needs of the ARM Program and to improve the quality of existing measurements. The component of the velocity vector, along the local vertical. Precipitation that falls from a cloud but evaporates before reaching the ground. The virtual temperature Tv = T(1 + rv/? ), where rv is the mixing ratio, and ? is the ratio of the gas constants of air and water vapor, ? 0.622. (1) The greatest distance in a given direction at which it is just possible to see and identify with the unaided eye, and (a) in the daytime, a prominent dark object against the sky at the horizon, and (b) at night, a known, preferably unfocused moderately intense light source. The portion of the electromagnetic spectrum to which the eye is sensitive, i.e., light with wavelengths between 0.4 and 0.7 micrometers. Compare this to the shortwave radiation and longwave radiation. A measure of the spin of a fluid, usually small air parcels. Absolute vorticity is the combined vorticity due to the earth's rotation and the vorticity due to the air's circulation relative to the earth. Relative vorticity is due to the curving of the air flow and wind shear. The region of turbulence immediately to the rear of a solid body caused by the flow of air over or around the body. A transition zone between a mass of warm air and the colder air it is replacing. A measure of the total amount of water vapor present in the column. A retrieved quantity from the microwave radiometer. The prevailing winds that blow from the west in the mid-latitudes. The difference in degrees between the air temperature (dry-bulb temperature) and the wet-bulb temperature. The lowest temperature that can be obtained by evaporating water into the air. The apparent temperature felt on the exposed human body owing to the combination of temperature and wind speed. The three-dimensional spatial pattern of winds. A difference in wind speed or direction between two wind currents in the atmosphere. An instrument used to determine wind direction. The cooling effect of any combination of temperature and wind, expressed as the loss of body heat. It is also called a wind-chill index. A large, conical, open bag designed to indicate wind direction and relative speed; usually used at small airports. Approximately December 22 in the Northern Hemisphere when the sun is lowest in the sky and directly overhead at latitude 23.5°S, the Tropic of Capricorn.